With its delicate wing-like embossing, the Monterey collection takes flight. Durable, affordable and sophisticated… an exceptional combination for an exceptional table. Tuxton china has been proven in restaurants, excelling through the rigors of everyday use such as: commercial grade dishwashers, salamander broilers. Tuxton ceramic dinnerware is nonporous and vitrified, and has surpassed the highest health standards required by culinary professionals. For nearly 20 years, Tuxton has been an industry leader in creating outstanding China by providing products that last, without sacrificing aesthetic appeal. This durable piece stands up against breakage, chipping, and scratches commonly caused by the wear and tear of everyday use. Fully vitrified to prevent moisture absorption. Oven, microwave, and dishwasher safe up to 500F. 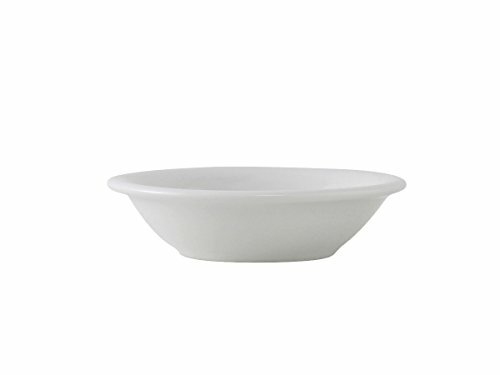 Tuxton ceramic dinnerware is lead-free and comes with a Lifetime edge chip limited warranty. If you have any questions about this product by Tuxton, contact us by completing and submitting the form below. If you are looking for a specif part number, please include it with your message. Gridmann NSF Stainless Steel Kitchen Wall Mount Shelf Commercial Restaurant Bar w/ Backsplash - 12" x 48"
Gridmann NSF Stainless Steel Kitchen Wall Mount Shelf Commercial Restaurant Bar w/ Backsplash - 18" x 48"